Many fellow Ubuntu users have been protesting the recent developments in user interface design, call it Unity/Gnome 3/whatever. But what can a user do? Of course one could migrate [back] to Debian. But I happen to really like the way Ubuntu has done many other things. And I've found a way to restore its usability. 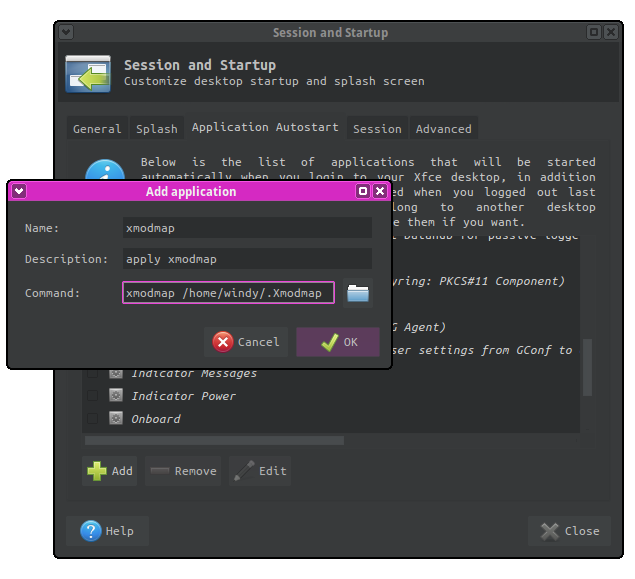 I'll also share a few extra tips that I've found useful with Ubuntu. This will also rebrand your distro as Xubuntu. Despite this superficial change, it will use the same repositories and, for the most part, will work exactly the same way as you're used to. One of the most satisfying biometric sudo moments! My terminal emulator of choice is rxvt-unicode, also known as urxvt. Living up to its name, it has great support for Unicode in addition to being fast and lightweight. It can be daemonized, which shortens the startup time of new windows even more. Needless to say, it's very customizable via Xresources. It also comes with a bunch of optional Perl extensions. 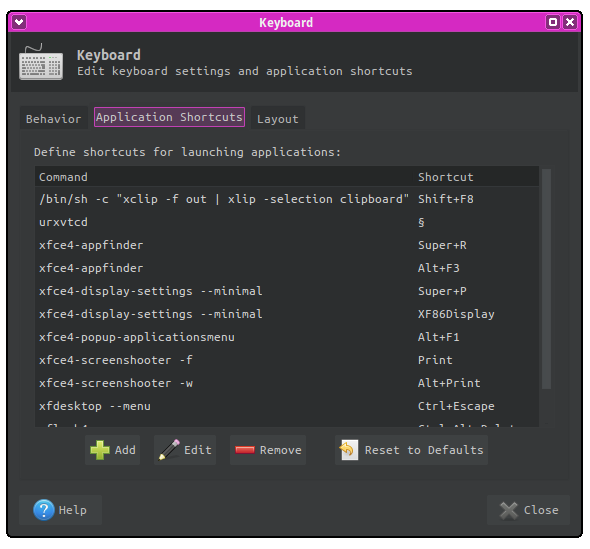 These keyboard tips work in Xubuntu and Xfce, but could be applied to other environments, too. 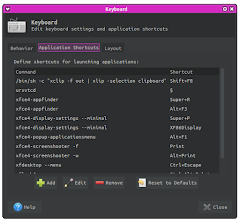 Keyboard shortcuts can be added in Application Menu → Settings → Keyboard → Application Shortcuts. For example, I've set the command urxvtcd to be executed when the section (§) key is pressed. This way you can map a seldom-used key to do something more useful, in this case open a new terminal window. I've also made it easy to copy text from XA_PRIMARY (the "mouse cursor" clipboard) to XA_CLIPBOARD (the "Ctrl+C Ctrl+V" clipboard) by adding a shortcut key to launch the command /bin/sh -c "xclip -f -out | xclip -selection clipboard". The Compose key can also be useful. It lets you quickly input many special characters not directly present on the keymap, using simple mnemonics. You can disable gdm's Sticky Keys and Slow Keys accessibility helpers by adding xkbset -a to the aforementioned Autostart list. You could also go with Kubuntu, the KDE version of Ubuntu. Also it also has its moments, it is not as cringe-inducing as the current GNOME whateveritis that is shipping with Ubuntu these days. Oh that's true :) I should add it to the post. Hi Oona, very nice screenshot. I'm also a xubuntu user, xfce is the only way to go. The window manager theme is 4dyne. I like it very much, too. 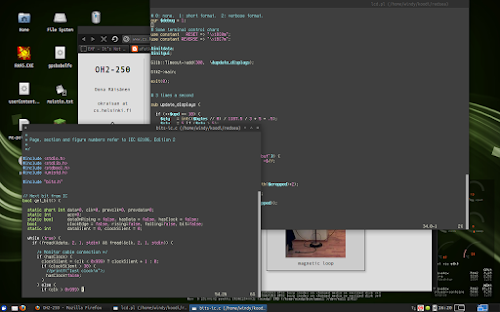 My Firefox theme is FT DeepDark, and the VIM color scheme is elflord. Many thanks for the prompt reply and the links, you're a star. The system monitor in the very back and lower-right, as well as whatever printed "Nov 9 23:00:02 pentti CRON ..." are spiffy. Do tell! The system monitor is Conky, and the log viewer is root-tail, if I recall correctly.